All tours except those noted will be available on all days listed on the previous page and are exclusive to our group. However, there are minimums required for these tours. If the minimum is not met, those interested in tours will be able to go on the regularly-scheduled Gray Line New York tours, which may differ from those listed below. Complete information for these tours can be found on www.graylinenewyork.com" or by calling Gray Line at 1-800/669-0051 or 212/397-2600." We will make online signup available here soon, please check back. View Times Square, Theater District, Lincoln Center area, upper West Side, Central Park, Cathedral of St. John the Divine, Harlem’s famous Apollo Theater, Harlem Market & Mosque, Striver’s Row, Sylvan Terrace, Schomburg Center for Research in Black Culture, Museum Mile, Fifth Avenue, Metropolitan Museum of Art, Guggenheim Museum. View Times Square, Theater District, Garment District, Madison Square Garden, SoHo, Greenwich Village, Little Italy, Chinatown, United Nations area, Rockefeller Center, Radio City Music Hall, Central Park, Lincoln Center, upper West Side, Harlem, Apollo Theater, Schomburg Center for Research in Black Culture, Striver’s Row, Sylvan Terrace, Museum Mile, Metropolitan Museum of Art, Guggenheim Museum. View Times Square, Theater District, Greenwich Village, SoHo, Little Italy, Chinatown, South Street Seaport, Garment District, Madison Square Garden plus take a guided tour of the United Nations building. Pickup at your hotel, transfer to Empire State Building for 1-1/2 hour visit to Observatory, transfer to hotel. Includes admission tickets to Empire State Building Observatory. Woodbury Common is New York’s most popular premium shopping outlet center featuring 220 stores offering the largest collection of designer apparel anywhere. Stores include Banana Republic Factory Store, Burberry, Calvin Klein, Coach, Barneys New York Outlet, Giorgio Armani, Gucci, Ermenegildo Zegna, Neiman Marcus Last Call Outlet, Off 5th Saks Fifth Avenue Outlet, Polo Ralph Lauren Factory Store, Tommy Hilfiger, Versace, Williams Sonoma Outlet, Timberland and many more. Each passenger receives a special VIP Coupon Booklet for additional savings at selected stores. Pickup at your hotel, transfer to Radio City for Backstage Tour, transfer to Madison Square Garden for guided tour, transfer to hotel. 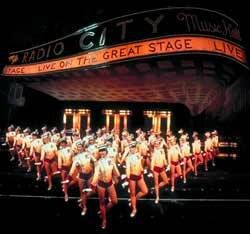 Includes admission tickets for guided tours of Radio City and Madison Square Garden. Pickup at your hotel, transfer to Madame Tussaud, transfer to hotel. Includes admission ticket to Madame Tussaud Wax Museum. Pickup at your hotel, transfer to Lincoln Center, transfer to hotel. Includes guided tour of Lincoln Center.